Most newborn photo shoots take place at my house in Hemel Hempstead but I do offer to travel to those who can’t get to me and cover areas such as Watford, St. Albans, Harpenden, Berkhamsted, Kings Langley, Luton and other towns close by in Herts, Beds & Bucks. Can you imagine my face when I walked in and saw a baby with such gorgeous hair?! He definitely wins the award of the newborn with the most luscious hair I’ve ever photographed. We started with sibling photos with his big brother. They were both so well behaved together. Marcus slept the whole way through! Next it was into my big crate. As baby Marcus was a little older, he filled the entire thing! He really did enjoy being wrapped though and continued to sleep soundly. When Marcus’ mummy gave me a blue hat for him to wear she looked at me like I was insane when I paired it with a brown wrap! I didn’t have a blue wrap with me that matched but a little bit of Photoshop magic later and all was fixed. Once unwrapped, Marcus was very much awake. I kept things nice and simple, using different wraps and moving him onto different blankets, capturing his little personality as he wriggled about. How cute are these photos on the white furry blanket?! Now if you thought his hair was impressive, just check out these eye lashes! I think it’s so important to capture these little newborn details as they change so quickly. And when they are as cute as this, how can I resist? It was a absolute pleasure to do Marcus’ newborn photo shoot. He has many years of wowing people with that hair and those lashes and I hope I get to photograph him again in the future! 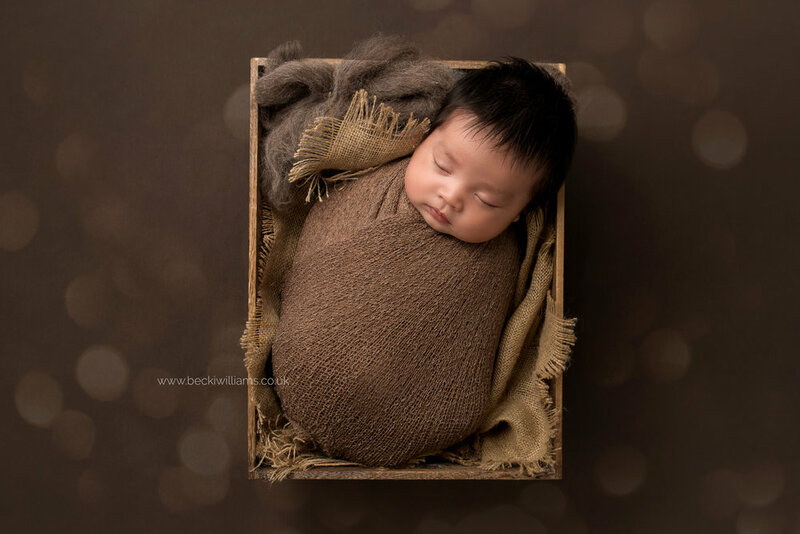 My name is Becki and I am a Newborn & Baby photographer based in Hemel Hempstead, Hertfordshire. I’ve been photographing babies full time since 2014 and have loved every second of it. I couldn’t imagine myself doing anything else! I pride myself on providing very relaxed and fun photo shoots, giving parents not only gorgeous photos, but great memories from the day as well.